John wonders where this is and says, "No. 2045 looks to be on station pilot duty. The picture is in the Real Photographs W series so probably by Will Whitworth suggesting Manchester/Crewe area. But what are the ex-North London carriages doing in that area? There is a name on the lamp but so indistinct that no more can be said than it looks like two words - London Road maybe?" I cannot identify the location but we have some working notices in the Archives that show that NLR carriages were borrowed by various LNWR traffic divisions for use on excursion trains over some weekends during the summer (trains were also borrowed from other southern companies for the same purpose). In some cases the carriages travelled a long way from London. Perhaps this photo shows one of those trains at Manchester. It very likely is Manchester London Road. Could be the MSJ&A platforms. Around 1921 a large number of old NLR sets were transferred to the LNWR and used for some years (say until 1926) on various local and workmen�s services. Leicester-Leamington had a number of these sets (see previous Mystery Photos), also West Cumberland. I don�t have any specific details of such a set in the Manchester area, but the surviving records are very incomplete. Perhaps it was just "passing through". I could be wrong, but the signals do not seem to have the electric solenoids that they should have if it was London Road. How about Stockport? But there again the gantries do not look right. Is this engine no. 2018? Anyone know where it was shedded? How about trip (target) 59 - where did that work? I can now confirm that the location is in fact Wigan North Western � see photo in LMS Journal no. 31, Page 66. This looks like Wigan (North Western) looking south, taken from the south end of platform 2 with the engine alongside (the longer) platform 3. These were the main Up and Down platforms; the NLR carriages would be in the bay platform beyond. A train for colliery workers, perhaps? No. 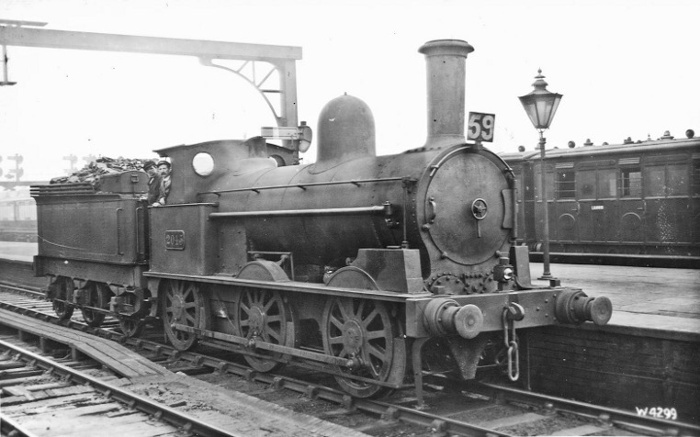 2045 was one of the "Coal Engines" which served with the R.O.D in France and returned to England in July 1919. This would probably date the photo to no earlier than 1920. No. 2045 is seen coupled to a large (2500 gallon?) tender, which I believe were used by all the R.O.D "Coal Engines", and appear to have remained with all of those which returned home for the rest of their service (whether with the LNWR, LMS and/or BR). However, oddly no. 2045 does not appear to have additional holes on the front bufferbeam for the sidechains, also fitted to all R.O.D engines. Lastly, I do not think that no. 2045 could have been used as a station pilot, as it was not vacuum fitted, and could not have been used to handle coaching stock. I hope this helps - and a Happy New Year. Regarding the suggestion that no. 2045 would need to be vacuum-fitted to act as station pilot - is this correct? I have it in mind that the rules about continuous brakes only applied to passenger trains - meaning trains with passengers aboard and not empty stock. On the other hand, I know that night trains to the north were shunted at Wigan with passengers aboard, so perhaps my point is not relevant. I agree that the engine not fitted with vacuum brake apparatus could not be used to shunt passenger carriages, that is, as a station pilot. The number 59 is a goods trip target to assist the signalmen in identifying the working. Page 155 of the book Springs Branch Motive Power Depot lists target 59 in 1920 as Bamfurlong Banker, engine type not specified, treble-manned 0700-0315 daily, to work Bamfurlong to Whelley. Not sure why the engine has turned up at Wigan NW station, but perhaps is under control orders to bank a passenger train to Standish (which was authorised in the Appendix to the WTT).